This weekend, Friday, Saturday and Sunday, August 5-7, is the Texas Sales Tax holiday weekend. Three days for shoppers to get a break on sales tax for back to school supplies. The law exempts most clothing, footwear, school supplies and backpacks priced for less than $100 from sales tax. On average shoppers save about $8 on every $100 they spend during the weekend. This holiday has been enjoyed every fall since it was implemented, back when Ann Richards was governor of Texas. Lists of apparel and school supplies that may be purchased tax-free can be found on the Comptroller’s website TexasTaxHoliday.org. Your retailer runs out of stock? Rainchecks may be issued! This year, shoppers will save an estimated $92 million in state and local sales taxes during the sales tax holiday, which has been an annual event since 1999. Southern Dallas County and Ellis County shoppers can stretch their dollars even further, as stores throughout the entire local shopping center at Hillside Village in Cedar Hill are offering back to school sales. Plus, the shopping center is offering a $15 gift card to everyone who spends $150 or more at any retailer or restaurant within the center. Shoppers must bring their receipts to the Guest Services Kiosk on the Village Green within the Center to receive their gift card. There will be a limit of one gift card per customer per day and shoppers must be 16 years of age or older to participate. Even better, the gift cards are available every Saturday in August as long as gift cards last. 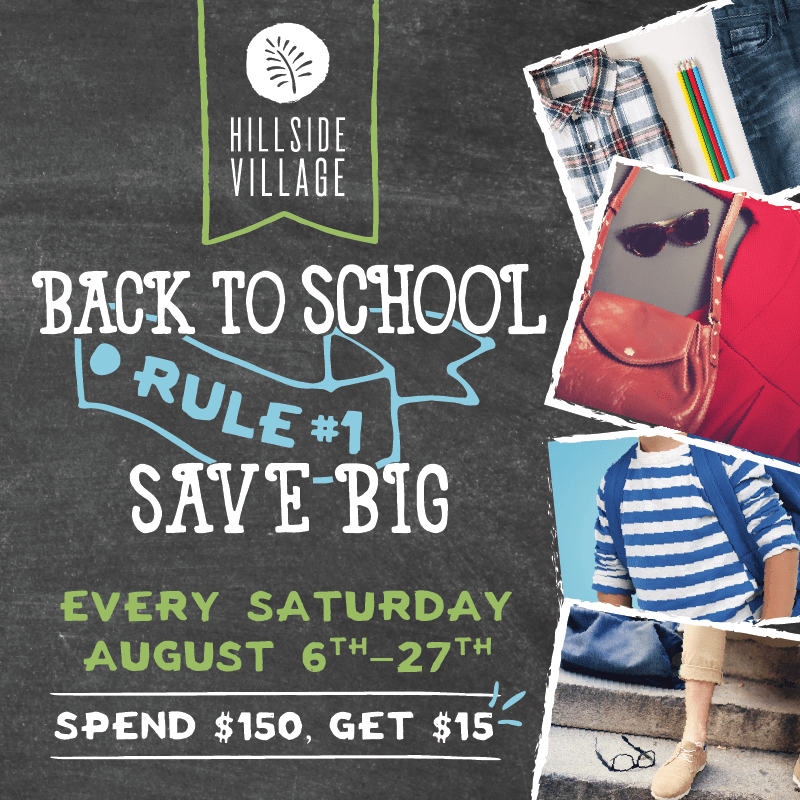 Back to School shoppers on August 6 and 7 will have chances to win a $100 gift card every hour. No purchase is necessary. Hours to enter are from 12-8 on Saturday, August 6 and from 12-5 pm on Sunday, August 7.